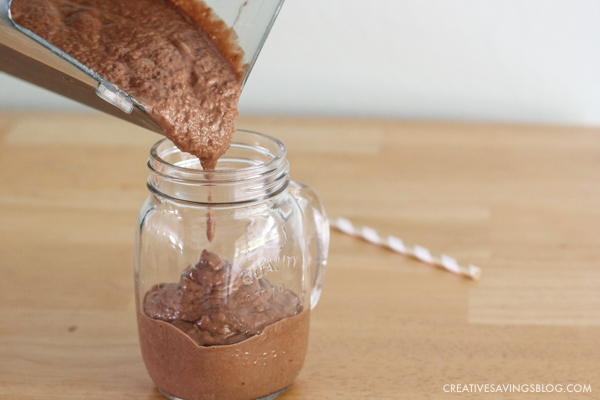 This Skinny Chocolate Peanut Butter Smoothie tastes like a decadent dessert, but packs a healthy, nutritious punch. Use as a meal replacement option for Breakfast, Lunch, or Dinner…it's a convenient treat you can enjoy anywhere! When I went through my 14-day sugar free detox last Summer, I knew smoothies would be the key to maintaining a healthy lifestyle going forward. By having a smoothie for breakfast almost every morning (except on rushed days when I reach for one of these delicious muffins to eat on-the-go! ), I can eliminate my usual go-to carbs like bagels, english muffins, and cereal, which for me, lead to extra weight. 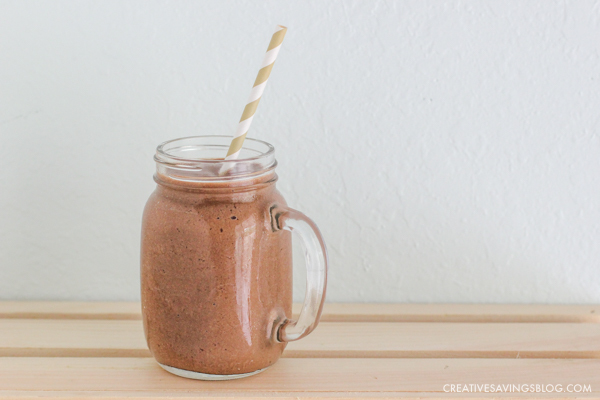 This Skinny Chocolate Peanut Butter smoothie is my absolute favorite recipe and a staple for my morning routine. There's no sugar added since most of the sweetness comes from the bananas (plus a little from the peanut butter, and you know how much I looooove chocolate-and-peanut-butter things). But it doesn't taste sugar free. No way. It's almost like you're drinking a decadent dessert! Plus, the avocado is a healthy fat that will keep your hunger level at bay all the way through lunch. No extra snacking needed. 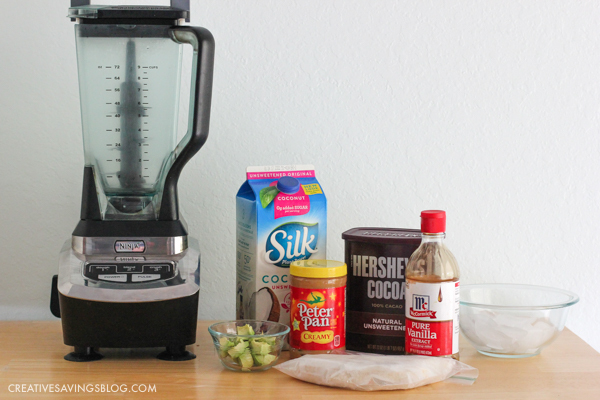 Step 1: Place half an avocado, frozen bananas, vanilla, cocoa powder, peanut butter, unsweetened coconut milk, and ice into a blender. I prefer the Ninja because it's so powerful and blends all ingredients in a snap. Step 2: Puree ingredients until smooth, pour into glasses, and serve with a straw. I just got these mason jar mugs for Christmas. Aren't they cute?? One of my favorite things about this smoothie is it's not too soupy. Well, unless you let it sit out on the counter for too long. 🙂 The tiny ice chunks actually turn it into the texture of a slushy. So good. 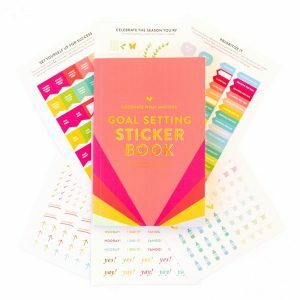 If you're looking for even more ways to support your health-related goals, I have a few more posts for you! 5 Creative Ways to Drink More Water – You'll be surprised at how many glasses you need a day. 9 Cute Workout Essentials Under $25 – Includes my favorite yoga pants EVER. 11 Easy Ways to Sleep Better Tonight – For me, sleep is directly tied to my productivity. It's way too important to skip! eMeals also has a very affordable Clean Eating Meal Plan if you wish someone could come up with all the right recipes for you. 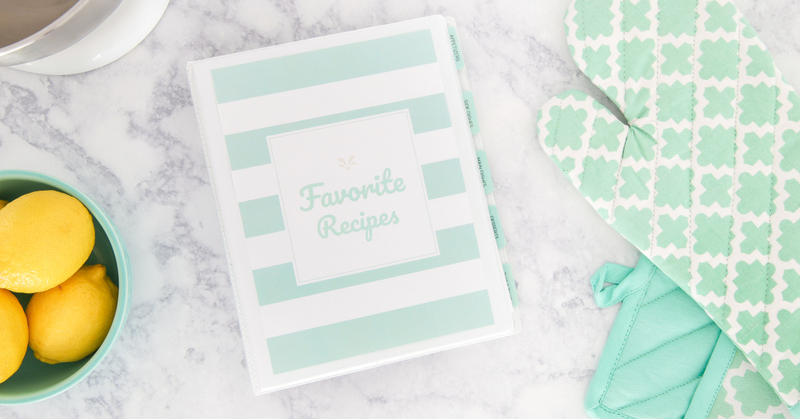 I always eat better when I have a plan—it prevents me from grabbing whatever I can find in the pantry! Sounds pretty good. I have to say I’m not creative on smoothies but my go to is a banana, peanut butter, chocolate milk and some frozen blueberries. It looks gross but it’s pretty good and very filling. 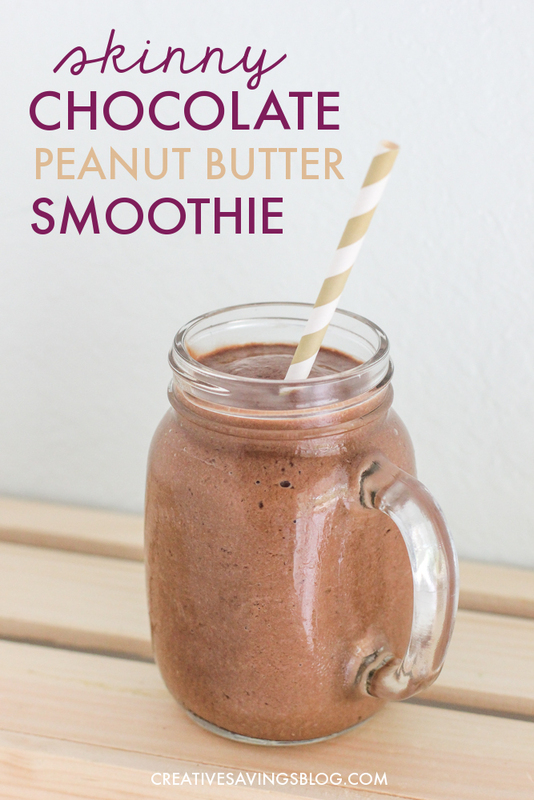 Peanut butter and chocolate are my favorites! I will have to try the avocado! I bet that makes it extra creamy:-) I buy ripe bananas and have my 9 yr-old chop them to freeze on a cookie sheet until firm. Then we add them to freezer bags. The bananas separate easily and we don’t have to use ice. Our refrigerator doesn’t have an icemaker so we have to use ice trays that no one likes to fill and refill! What can I use in place of the banana? I haven’t tried anything else. 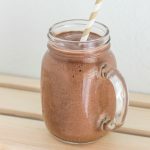 If you don’t want to use the banana because of flavor, you really don’t taste the banana in this smoothie – It just provides the natural sugar so that the chocolate isn’t overpowering. 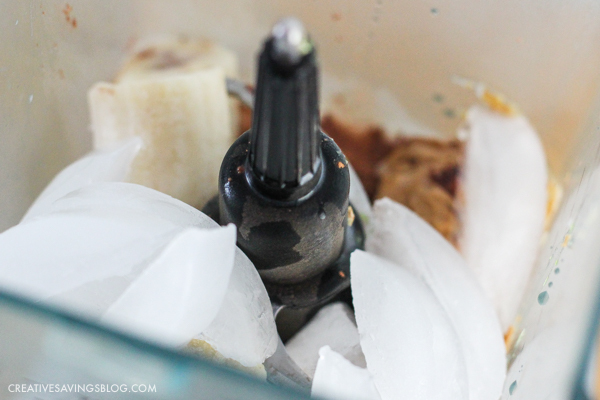 If you have an allergy or a dietary restriction, you could try another frozen fruit that you would enjoy with chocolate. Maybe Strawberries. You just will want something with natural sugars otherwise the chocolate will be bitter. Love avocados, but we live in a rural area where such “exotic” produce is either unavailable or ^$$$. Is the avocado in for texture as well as nutrition? Would regular milk work? I don’t really buy coconut milk. Most definitely! We make it with regular milk when we run out of Silk and haven’t gotten to the store yet. The taste is a little bit different—I prefer the coconut milk—but the texture will be the exact same. I recently bought an avocado and coconut milk, without a specific idea of how to use them. Now I know! 🙂 This is my new favorite smoothie recipe. Thank you so much for sharing it, Kalyn! I’m trying to eat healthier, but still want something that tastes good. This is perfect! It’s like dessert, and the texture is great. So glad you like it, Brittany! I’m still having this for breakfast literally every single morning. Do you consider this low sugar with the bananas? There’s added sugar in the peanut butter and of course the bananas have natural sugar. Each serving has 29 net carbs.